ElectraLink’s latest figures today show that Ofgem’s newly introduced price cap is currently having no significant impact on customer switching rates in the energy market. The well-publicised extension of Ofgem’s price cap was brought into force on the 1st January 2019, making the cap applicable to all customers on default tariffs, prepayment meters and recipients of the Warm Home Discount. Despite the message from Ofgem that customers may get a better deal if they continue to shop around, there was a risk that consumers may have viewed the price cap as an alternative to switching. However, the latest intelligence from ElectraLink shows that that is currently not the case. 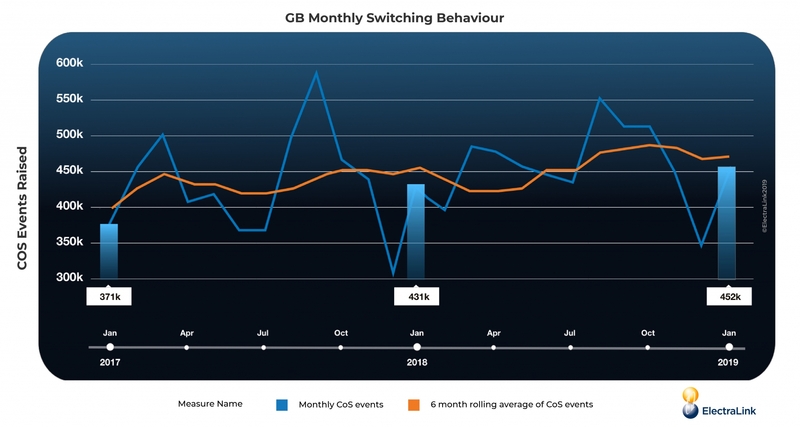 ElectraLink’s data reveals a gradual rise in switching rates over recent years and demonstrates that this trend has continued into the early part of 2019. Big 6 suppliers have a larger proportion of customers on standard variable Tariffs (SVT’s) and ‘default’ tariffs, and it could be logical for switching patterns amongst this group to be impacted by the Price Cap.